Boxes and boxes of wonderfully arranged roses on Instagram! Have you seen these? Please tell me you have because they seem absolutely viral to me, well viral as far as those super expensive yet dreamy lifestyle accounts on Instagram go. If you don't know what I'm talking about, check out these beautiful rose decor pieces here, here, here and here. They look so classy, chic and expensive and guess what- they actually are! 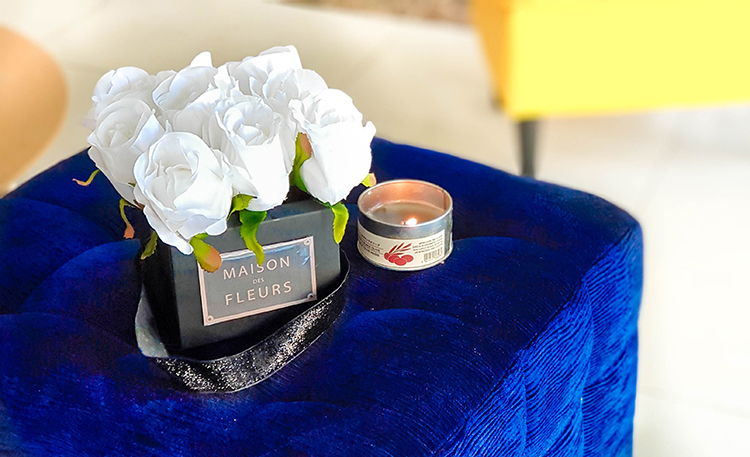 In the UAE, a tiny box of 16 roses of these from Maison de Fleurs sets you back 385 dirhams and I made it for: 10 dirhams! Granted, mine aren't fresh roses but they look just as good and pretty. 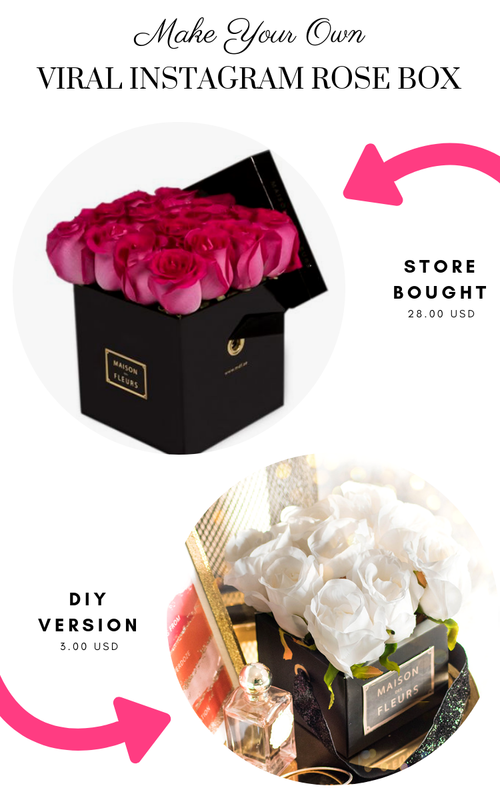 The #rosebox tag on instagram itself yeilds over 97,000 results guys, that is insane- but nowwwww, you can DIY your own! 1. A sturdy cardboard box. The box looks best in neutral colors like white, black or even a pastel pink or blue. i really love how sophisticated black looks, especially paired with white roses. Plus, I had a Patchi Chocolates box on hand so this cost me zero! 7. The logo of your company of choice. I know Maison de Fleurs, Ace of Roses and The Million Roses sell these so i just found a logo and printed it out. I recommend photo paper but i did not have it on hand. 2. Measure down half way through the width of your box as shown and about one-third from the top edge and mark it with a pencil. Do this for the opposite face of the box as well. 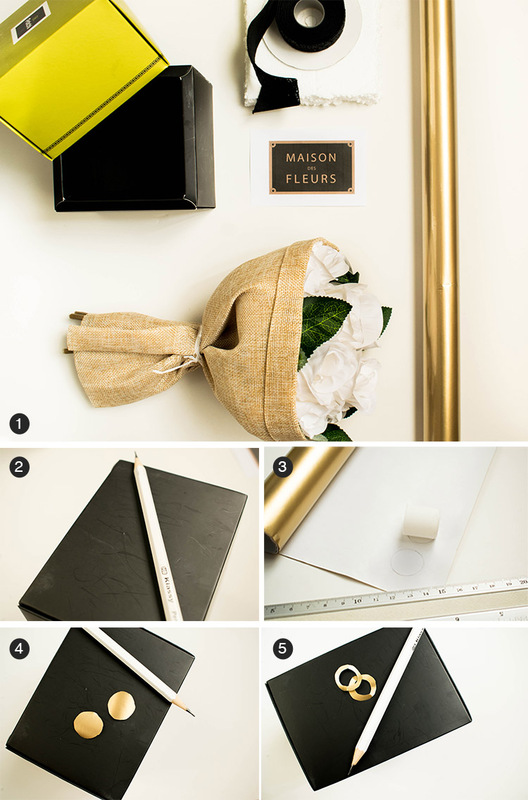 We are doing this because if you look at the boxes on the Maison de Fleurs page, they have this gold detailing on the sides where the ribbon loops through and I'm ALL about those little details. 3. I used by gold giftwrap paper to trace out a circle using the back of a gluestick's lid. However, a smarter idea would just be to use any o-rings from the hardware store if you have them on hand and spray paint them. They look more elegant and expensive. 5. Cut through smaller holes in both the circles so that you only have a circular frame to glue on to the areas marked on your box faces. 8. Begin by eyeballing how much of the rose's height you'd like to see peeking out of the box. Once you are satisfied with how much length you want, take this as your guideline. 9. Cut through all the other roses as close to the same length as your guideline rose. 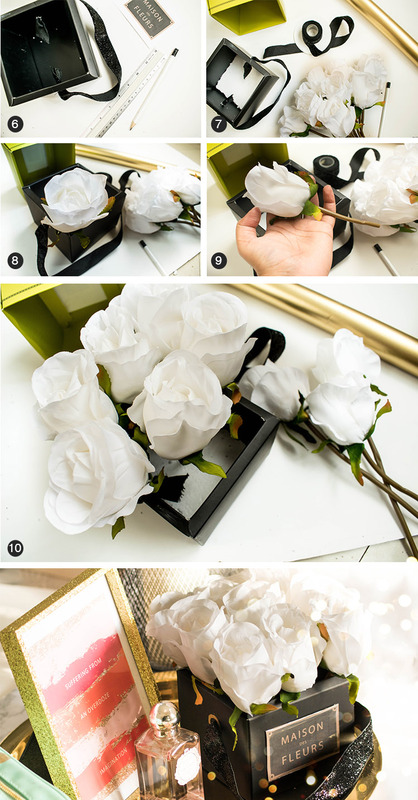 Use a wire cutter or pliers to carefully break of the stem if it is supported with floral wire. 10. Don't be worried if the roses don't seem to stand up straight at first and sort of sag over. Once we have them all in the box, they'll support themselves much better. 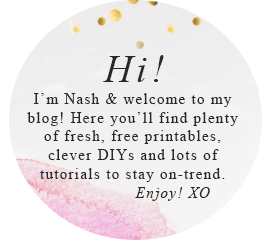 Final touches: Cut out your logo or print it out on sticker/label paper and stick it on to the box. Voila, you're done! Let's do a cost breakdown, shall we? Like I said earlier, the cost of a 16 rose small box in UAE is 385 dirhams. That makes it around 24 dirhams for one rose. I have 9 roses in my box so that should total up the cost to 216 dirhams for 9 roses and I made mine in 11 dirhams because I only needed to buy the rose bouquet. I had everything else on hand. Even if you don't have the box on hand or the ribbon (I don't know how someone cannot have a ribbon available), it still costs extremely cheap. That's a crazy amount of difference for something that looks pretty similar, don't you think? I actually had a friend mistake the DIY one I keep in my office for the real ones, isn't that amazing? These would make adorable gifts too for family and friends. I've seen a lot of boxes sold paired with other itty bitty desserts or with chocolates that come out of a drawn hidden underneath the box. That sounds even more delectable and luxurious. If you can find such a box at your local craft store, then you can make something similar. It's double glam! These boxes obviously look best styled with other chic items. They don't have to be expensive. 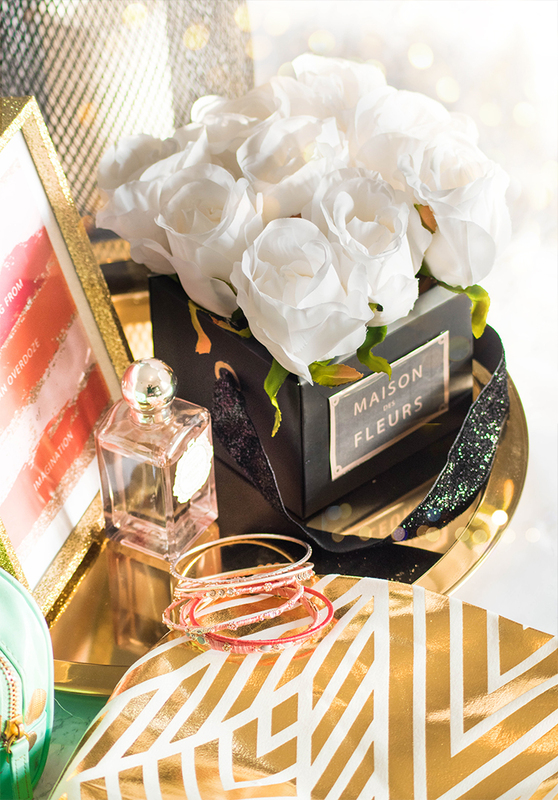 For my styling, I coordinated my rose box with a gold tray that looks absolutely stunning from IKEA, a glittery gold frame from Home Center (which was again about $2.00 on sale and a lovely bottle of perfume with a patterned gold accent fabric, again for around $3.00). Like I said, it only looks expensive. You could also style these with some lovely books on your coffee table or work design with a warm cozy candle or maybe some favorite jewelry pieces to showcase. That would look super too! How did you like this DIY? Would you make your own or gift one to a friend? Let me know!